Your car is insured by us while under our custody, with the company MMA. Easy-Parking can only be held responsible in case of theft of vehicle under its responsibility, or material damages on this vehicle. This liability starts at the date & time of departure and ends at the date & time of return. 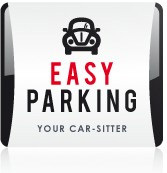 Easy-Parking cannot be held responsible in case of any damage or theft inside the vehicle. It is strongly recommended not to leave any value item inside the vehicle. Easy-Parking cannot be held responsible in case of any mechanical problem while the car is under its responsibility. If a mechanical problem impeaches the car to be driven back to its owner, he will be proposed the best solutions for repairs in a chosen garage, at the terms and conditions of any garage repair.